Zimbabwe will play the 2nd T20 match of the series against South Africa on 12th October, Friday. South Africa defeated the visitors by 34 runs and went up by 1-0 in the three-match T20 series. Match Date: 12 October, Friday. Zimbabwe Squad: Hamilton Masakadza (C), Brendan Taylor (WK), Elton Chigumbura, Chris Mpofu, Chamu Chibhabha, Sean Williams, Kyle Jarvis, Tarisai Musakanda, Peter Moor, Tendai Chisoro, Brandon Mavuta, Tendai Chatara, Wellington Masakadza, Solomon Mire and Neville Madziva. Wicket-Keeper: Quinton de Kock (C). Batsmen: Hamilton Masakadza, Rassie van der Dussen, Faf du Plessis and David Miller. All-Rounders: Andile Phehlukwayo and Sean Williams. Bowlers: Imran Tahir (VC), Junior Dala, Kyle Jarvis, and Chris Mpofu. Batsmen: Hamilton Masakadza, Rassie van der Dussen (C), Faf du Plessis and Peter Moor. 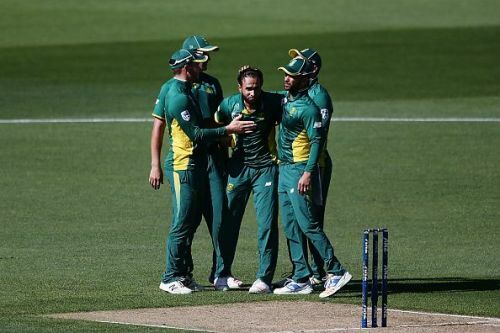 Bowlers: Imran Tahir, Lungi Ngidi (VC), Kyle Jarvis, and Chris Mpofu. Quinton de Kock, David Miller, Rassie van der Dussen, Faf du Plessis, Imran Tahir, Lungi Ngidi, Andile Phehlukwayo, and Sean Williams.